The conference will be held in at the Parksville Community and Conference Centre. Parksville is located on the east shore of Vancouver Island, and is accessible by air and road/ferry. Air Canada or Westjet: To Nanaimo (YCD), then drive 50 km (31 miles) north. Driving from Nanaimo Airport to Parksville takes approximately 40 minutes. Air Canada or Westjet: To Comox (YQQ), then drive 92 km (57 miles) south. 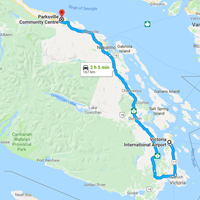 Driving from Comox Airport to Parksville takes approximately 1 hour. Multiple commercial carriers: To Victoria International (YYJ), then drive 164 km (102 miles) north. 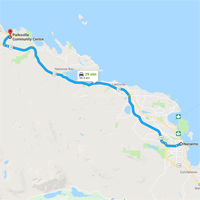 Driving from Victoria Airport to Parksville takes approximately 2 hours and 5 minutes. Harbour Air and Seair: Seaplanes from either Vancouver (YVR) or downtown Vancouver harbour to Nanaimo harbour, then drive 37 km (23 miles) north. Driving from Nanaimo to Parksville takes approximately 30 minutes. Private plane: Fly from Vancouver (YVR) to Qualicum Beach (XQU), then drive 15 km (9 miles) south. 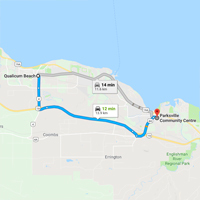 Driving from Qualicum Beach Airport to Parksville takes approximately 15 minutes. From Horseshoe Bay (West Vancouver, BC) to Departure Bay (Nanaimo, BC), then drive 31 km (19 miles) north. The ferry crossing takes approximately 1 hour and 40 minutes, and driving from Nanaimo Harbour to Parksville takes approximately 30 minutes. Click here for Horseshoe Bay/Departure Bay BC Ferry schedule. From Tsawwassen (Vancouver, BC) to Duke Point (Nanaimo, BC), then drive 52 km (32 miles) north. The ferry crossing takes approximately 2 hours, and driving from Nanaimo to Parksville takes approximately 30 minutes. Click here for Tsawwassen/Duke Point BC Ferry schedule. From Tsawwassen (Vancouver, BC) to Swartz Bay (Victoria, BC), then drive 146 km (91 miles) north. The ferry crossing takes approximately 1 hour and 35 minutes, and driving from Victoria to Parksville takes approximately 2 hours and 30 minutes. Click here for Tsawwassen / Swartz Bay BC Ferry schedule. From Port Angeles, WA, USA, to Victoria, BC, then drive 146 km (91 miles) north. 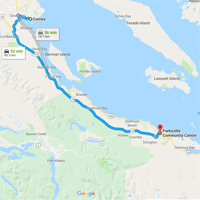 The ferry crossing takes approximately 1 hour and 30 minutes, and driving from Victoria to Parksville takes approximately 2 hours and 30 minutes. Click here for Port Angeles / Victoria Black Ball Ferry schedule. From Anacortes, WA, USA, to Sidney, BC, then drive 165 km (103 miles) north. The ferry crossing takes approximately 2 hours 45 minutes, and driving from Sidney to Parksville takes approximately 2 hours and 30 minutes. Click here for Anacortes / Sidney Washington State Ferry schedule. 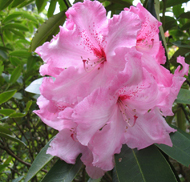 When driving, take exit 51 from BC Highway 19 and proceed northeast on BC Highway 4A (Alberni Highway). 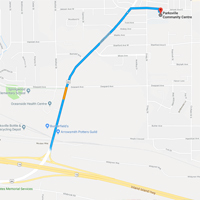 Turn right (east) on Jensen Avenue and drive 2 blocks to the Parksville Community Centre on your right.